Deas Vail's indie-rock sound is strongly piano-backed, with awesome guitar-work that ranges from crunching to ethereal - all a perfect setting for frontman Les Blaylock's truly amazing vocal range. Simply brilliant! Music Manager's Review: Deas Vail is a relatively new band on the Christian music scene. Their unique sound ranges from crunching to ethereal. This album features some awesome guitar work and amazing vocals! I really like where they're taking contemporary Christian music. 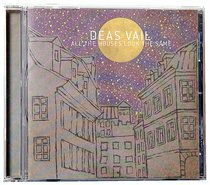 About "All the Houses Look the Same"
Deas Vail is an indie rock band from Russellville, Arkansas formed in 2003. The phrase "Deas Vail" is a combination of Latin and old French which roughly translates to "Humble servant of God." Deas Vail is a band with a story to tell, and they're doing it one note at a time. Melodic vocal lines and lullaby guitars; "I'm-telling-you-a-ghost-story" piano parts and syncopated beats. Earnest, searching rock music.